The first pullback after a strong and decisive break from an obvious structural pattern, should be considered a MUST-TRADE scenario. Now, I don't advocate trading just one pattern. But this one… should definitely be in your trading arsenal. Note the three points displayed in the social media post above. The key is ensuring you have these in place. A pullback towards the point of breakout! Let's look at this idea play out in a few other charts. 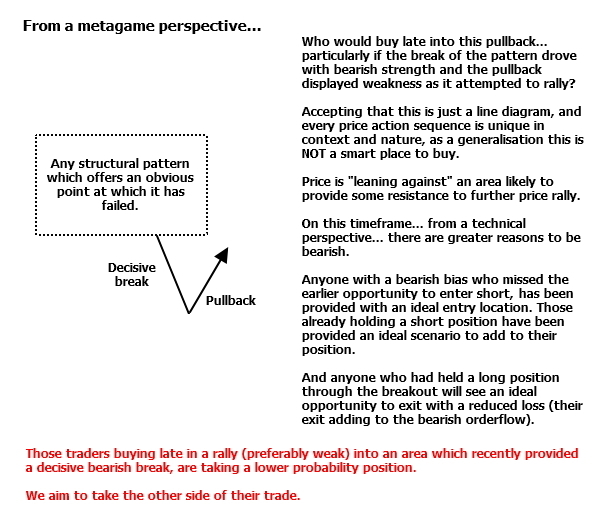 And why not mix it up a little as well… with a completely different market and timeframe. Here's the AUD/USD spot forex pair on a four hour chart. Yes, for different instruments there may be some adjustment required to allow for the different nature of price movement, in particular with trade entry and exit decisions. But at a conceptual level, it's the same idea. A retest of the point of structural change is a good trade location. 1. Both examples so far have been channel breaks. This is not just a channel break concept. It can be ANY form of structure. The more obvious the better. You want other traders seeing it as well. 2. You'll note in both prior examples that the structural pattern is a quite large macro-level pattern (comprising a WHOLE LOT of candles). Again, this is not a requirement. The concept works just as well on smaller micro-level patterns. First up, let's go back to Crude. Because I just LOVE the level that formed in the topping pattern in this example! Interestingly, these are the type of levels which I absolutely love to see form a trap before continuing higher. But when they do break, as in this occurrence, look to the retest on the lower timeframe chart to seek your entry short. 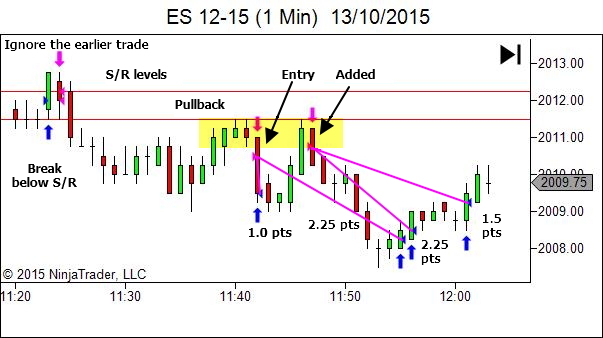 And finally one with a trade… in the Emini S&P! 1. Note how the retest is not so quick in this case, giving a LOT of time to work your entry. This is a good example of the different nature of different markets, which we referred to briefly above. 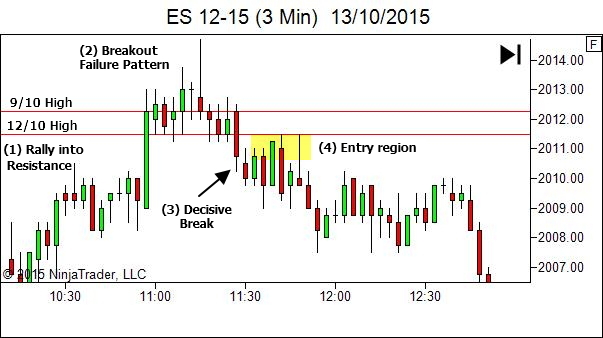 With ES often being slower and less directional, trade entry and management will be different to the style used in Crude Oil, for example. 2. Our definitions of a "decisive break" may well vary. Note in this example how it doesn't drive with as much strength or distance as perhaps occurs in a "textbook" example. But context is important. The break of the 9/10 and 12/10 session highs was significant. And price was unable to show any definitive bullish strength following that break. A failure of the breakout here is structurally important, and combined with the earlier bullish weakness above the S/R levels, was to me sufficiently important to be considered a "decisive break" of the higher structure. (Side-note: If you're interested in seeing some further discussion of the price action above the S/R levels, have a look at both these social media posts from the 14th October and the 15th October). Regardless… the concept remains the same. 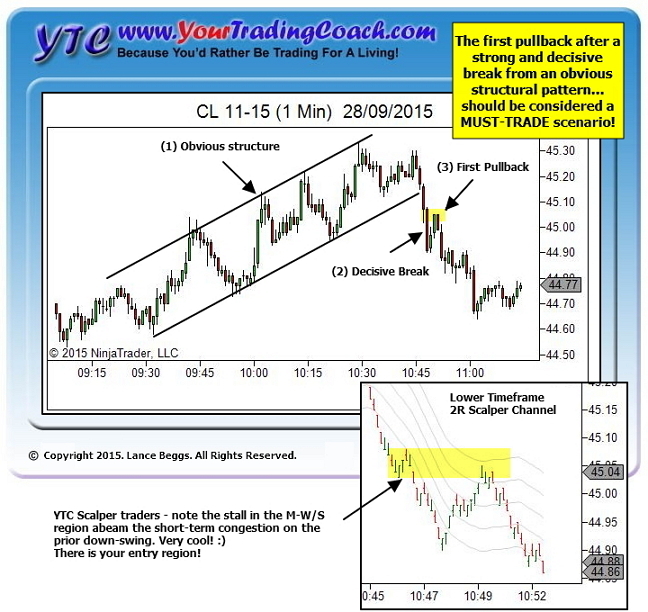 Look for an obvious structural feature which breaks in a decisive manner, and seek trade opportunity on the retest. And here's the outcome… zooming into the 1 minute chart to see the finer detail. I'm clearly not retiring off that trade, but it's all the market offered. No matter your market or timeframe, search your historical data for examples like this. Study them. Why? Because these price action patterns are not just obvious in hindsight. They should be clearly visible in real-time as they occur. Fill a book with examples. And cover them with notes clearly highlighting and examining the structure, the break and the pullback. Note how you could have timed the entry into the pullback. Note how context could have suggested the ideal approach to trade management and exit. And importantly… be sure to include examples where a retest of a point of structural change FAILED. Was there some way to see this as a lower probability trade and avoid it entirely. Or if not, were there clues post-entry which should have suggested scaling out or scratching entirely to minimise risk. A "pattern" like this, when considered in context, can provide you with almost infinite variation from one example to another. STUDY THEM. FILE THEM. REVIEW THEM. OFTEN. can you please show some examples for longs as well, similar to the examples for the shorts? It’s the exact same thing. Just opposite direction. I’ll look at a possible followup article sometime in the future, with some LONG examples. Great! Thanks Lance. I know they would be mirror images, but would be very useful to see them. I guess the emphasis here has to be on the word decisive. 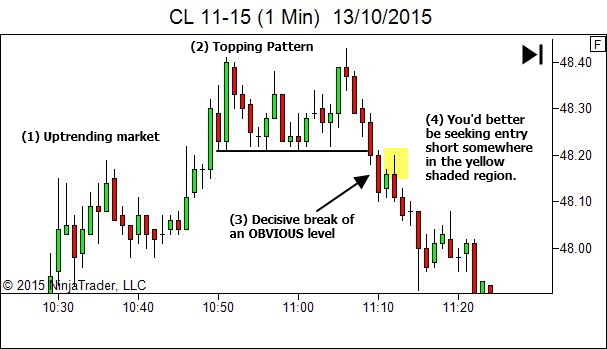 If the structure were a (prolonged) trading range you would have to worry about the fact that most breakouts fail. Right!? Can you give us some guidance as to what rule you created to label a breakout decisive? Thanks again for your thoughtful article. There are no “rules”. It’s all contextual. It’s when the structure has changed and you have NO doubt. It’s not like the push back below the level here only moved a tick or two. The initial break higher was massively significant, taking price into clear space from which it had good potential to run (did you look at the 14th & 15th October social media posts). It couldn’t rally though. This is also significant. And when it broke back below the levels it moved by a distance approximately equal to the whole distance it was able to gain above the levels. It’s not just a poke back below. It’s enough to provide absolutely no doubt in my mind that the original breakout to multi-day highs was a failure. On a less liquid and more directional market such as CL you’d expect to see a larger wide-range bearish candle. But on a thicker market such as ES this is about the best you can hope for. Thanks so much for your feedback! BTW, this sounds like the Anti setup in Adam Grimes’ book. There is certainly some overlap with the Anti. Some of these setups will also classify as an Anti. But not all.